"Rise of the Hollow Men" - Part Three: "Time & Tannarak"
It is 45,025 B.C. Atlantis is under threat from Tannarak and an army of Atlantean clones. Arion, a young mage, is the only hope for the people of the kingdom. Tannarak is very confident but his plan is foiled when Arion reveals his secret alliance with Phantom Stranger. Together they destroy his Hollow Men and Tannarak vanishes. It is the 10th Century. Viking Prince and his men are investigating an old man's stronghold. A deep cavern swamped in the odor of magic. The old man is Tannarak, his magic? A clone army of Viking Prince Jon. They destroy his army and Tannarak's plan of infiltration is foiled. It is 1884. Eben Took has lost his wife and infant son. Without a bloodline to grow Took is devastated that his move to America will destroy his family. Tannarak arrives on Took land at that moment and promises if Took willingly helps him he will resurrect his son. Sacrificing a kidnapped child under the light of a full moon begins the process but for Tannarak to grow strong and fulfill his promise it will take decades. Eben agrees to help in exchange for immortality. A blood oath is struck as Took adopts Tannarak into his bloodline and the Took family grow and grow into his new Hollow Men. It is today. Phantom Stranger is imprisoned, Krypto unconscious and Conner is face to face with Tannarak. The old wizard asks Superboy to join him and lead the army of Superboy Clones. Conner refuses and Tannarak uses a Darth Vader style death grip to suffocate him. Is this the end of Superboy's new life? Story - 4: This issue is dedicated to explaining Tannarak. It had to be done but like last issue it feels forced. There is none of the beautiful story arc style here, instead it's a thinly veiled advert for Arion back issues and the newly printed Viking Prince trade paperback. I want to know about the villain of course, if not why bother with the story at all, but with Superboy's, Lori, Simon & Sujan's never-ending battle ending in next week's twenty-two pages it feels forced. I feel Jeff Lemire had a far more in depth story to tell and a promo for other products was not part of the plan. Aside from the issues mentioned the story DID flow well. Tannarak just doesn't seem deadly enough. He's nowhere near the level that could be capable of corrupting Superboy into ending the world which was clearly the plot since issue #1. Art - 4: Usual visitors to the site know one of my major pet hates is lack of consistency in artwork. The jumps in time throughout work really well and the diverse styles in art balance incredibly well with that theme. Has it changed my opinion? No, I still think art chores should be dealt with by one artist per story arc, however on this occasion they did a very clever job of covering for it. 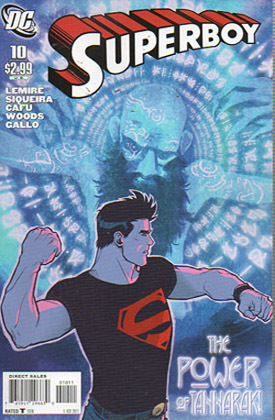 Cover Art - 3: The cover is credited as Karl Kerschl alone but though his Superboy (with the wrong shield again) looks ready to deal out justice, Tannarak looks almost like a puppeteer rather than an opponent. What happens NEXT would have been a knockout cover - literally!